LOUISVILLE, Colo. (April 6, 2017) — Gaia, the world’s largest network of conscious media, announces the debut of Yogic Paths, a new docu-series capturing a deeper exploration of yoga. Filmed throughout India, Yogic Paths shares unprecedented conversations with spiritual leaders while taking the viewer on a journey through the many traditions of yoga. The first of its kind, Yogic Paths is a collection of incredibly honest and thoughtful interviews that touch the heart and encourage self-discovery, reminding us how deeply we are all connected. Yogic Paths features 13 episodes and explores eight forms of yoga including Hatha, Bhakti, Jnana, Karma, Tantra, Raja, Kriya, and Kundalini, as well as the esoteric practices of Nada and the Siddhis – all of which ultimately lead to self-realization. Narrated by Sally Kempton, the series features spiritual leaders from across the globe including; Prashant S. Iyengar and Geeta Iyengar (son and daughter of Yogacharya BKS Iyengar) Krishna Das, Krishna Kaur Khalsa, Anand Mehrotra, Nataraj of the Sivananda Ashram, H.H Pujya Swami Chidandand Saraswati and Dr. Jim Mallinson. 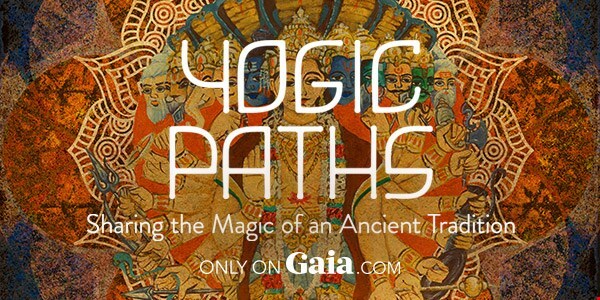 Yogic Paths launches today, April 6th to subscribers of Gaia. For more information and membership rates, please visit Gaia.com. About GaiaGaia (NASDAQ: GAIA) is a streaming video subscription service offering exclusive streaming conscious-media content. Gaia’s library contains more than 7,700 films, documentaries and original programs to guide its viewers on their journeys of personal growth, spirituality and seeking truth. Gaia is currently available on Apple TV, iPad, iPhone, Roku, Chromecast and the web and is also sold through Comcast and Amazon.